If there was any hope for the rather lifeless back half of this season of The Strain, it was that the narrative was primed for a shift. So much of this second season has felt like tablesetting, as if the writers knew the destination but had lost the map detailing how to get there. That means that large portions of this season, especially the last few episodes, have lacked a real sense of purpose and urgency. Every predictable narrative beat has contributed to larger storytelling complacency, with The Strain struggling to find a way forward for each character, to keep them interesting and engaged in meaningful storylines. “Night Train,” the second season finale, is the culmination of those individual, stagnant storylines, and despite the way the episode chews through plot at a rapid pace, the payoff is underwhelming. The problem is that while a lot happens in the finale, most of it doesn’t mean a thing. There’s no sense of consequence, no tension, and hardly any stakes. As much as the show, with all of its endless exposition, tells us that Eph and his Merry Band of Vampires are fighting to save the human race, there’s little evidence to support such a claim. 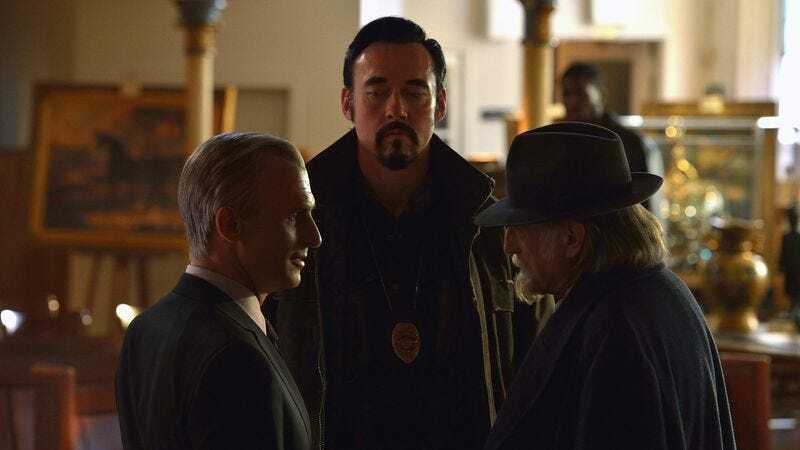 The Strain has spent much of the season focusing on small-scale conflicts, from the Fet-Dutch-Nikki love triangle to Vampire Kelly’s search for Zach, meaning that the sprawling ambitions of “Night Train” end up feeling empty. The one payoff that actually works is, somewhat surprisingly, Setrakian’s bid for the Occido Lumen. The season-long build was certainly tedious, the show just buying time and Setrakian’s arc standing still, but the actual bid for the Lumen is one of the few scenes in tonight’s finale that seems important. Part of what makes it exciting is the fact that, as promised, Eichorst shows up to bid on the book rather than Palmer. Palmer isn’t a very interesting character, whereas Eichorst is wonderfully campy. Plus, as the always loyal but not necessarily highly regarded sidekick of the Master, Eichorst’s role in the bidding adds significance to the scene. If the Lumen contains the origins of the Master, and therefore may contain information on how to destroy him, having the final duel come down to Setrakian and Eichorst makes the most sense. More than just the added weight though, the scene is delightful because both Richard Sammel (Eichorst) and David Bradley (Setrakian) treat the bid like an old school Western standoff. They try to intimidate one another, getting in barbs before the bidding even begins. Having Fet there as Setrakian’s wisecracking, rebar-wielding bodyguard certainly helps add tension to the situation. The bid, which is eventually won by Setrakian after Palmer pulls Eichorst’s funds, is also responsible for leading to some of the finale’s more thrilling action. When Eichorst and his army of strigoi catch up with Fet and Setrakian on the road, they attack the truck in an attempt to steal the Lumen. The following gun battle is a lot of fun because it shows The Strain shaking things up. There’s Fet and Setrakian escaping through the sewers while Gus, Quinlan, The Silver Angel, and all of their freed prisoners show up and go after the Lumen themselves. This three-way battle for the book is the most interesting material the show has right now, as it tests the loyalty and morality of every character, and leaves a lot of questions on the table as to how the Lumen can be used. Setrakian wants to use it as bait, and that’s something Quinlan can get behind. Whether their tenuous alliance will last is something left for season three. If the payoff of that storyline feels at least somewhat earned based on everything that came before it, the biggest issue with tonight’s finale is that it’s built around a single moment that’s meant to be emotionally devastating but falls flat because of how little work has been put into the story prior to “Night Train.” When the train that Eph, Nora, and Zach are travelling to D.C. on is derailed and attacked by strigoi, the three get separated. Nora and Zach take off through the tunnels, hoping to find a way back to the station where they can rendezvous with Eph. While doing so they run into Kelly, who has once again made a timely appearance. She and Nora face off, and it’s a vital confrontation, one that, depending on how much leeway you’re willing to give the writing, is laced with significance given the ever-present tension between Kelly as Eph’s ex-wife and Nora as his on-and-off lover. After a tense battle, with Kelly showing just how strong she is, Nora finally gets the upper hand. Just as she’s about to kill Kelly, Zach shouts for her to stop, and the moment of hesitation allows Kelly to deploy her stinger and latch on to Nora. She’s infected now and she’s going to turn. As Zach walks off with his vampire mother for some reason–seriously, does this kid still not get that she’s dead/a threat–Nora can only watch and writhe in pain. Moments later Eph finds her, and while he wants to help her, she knows there’s nothing left to do, so she places her sword on the third rail and electrocutes herself to death. There are so many things wrong with the way Nora is dispatched that it’s going to be a struggle to not have every sentence in this paragraph end with exclamation marks, but I’ll give it my best shot. The most glaring issue with the scene is that it relies on the barely-explored romance between Eph and Nora as its emotional base. The scene is written and structured as if it’s a grand emotional payoff to weeks of nuanced storytelling, when it truth it’s a contrived and meaningless death coming off of a barely revived love story that was shoehorned into last week’s episode. I already argued that last week’s focus on the beginning of Eph and Nora’s relationship felt out of place, but knowing that it was put in that episode as a way to set up Nora’s death in the finale makes it feel not only contrived, but disgustingly cheap. And just like with Dutch only a few episodes ago, Nora’s death, and really her whole existence on this show, is used to further the story of the male protagonist. Seeing Nora, a strong-headed, smart, resourceful character, discarded in such a cheap, haphazard way–in the books (spoiler) she not only survives, but also ends up romantically involved with Fet–is not only disappointing, but just shows how tone deaf The Strain is when it comes to its emotional beats. 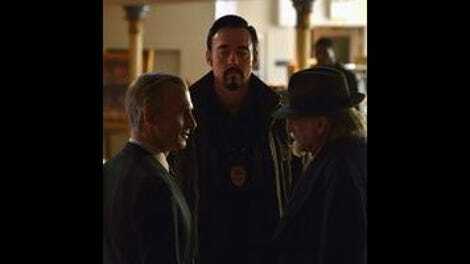 “Night Train” is, essentially, representative of the second season of The Strain as a whole. It has some fun with its mythology and horror elements, especially when it comes to the Lumen and Eichorst’s swarm of strigoi, but fails to make the emotional beats connect. It’s a finale that certainly shakes things up and presents a lot of changes in terms of the future of the narrative, but the same problems remain. There’s still no attention paid to character, no consistency to their actions and dialogue, and the supposed empathy and pathos in Nora’s final moments are completely unearned. For a finale where so much happens, very little has actually changed. What ever happened to that cartoon credit sequence? Was that a one-episode deal? Hey, remember how the Stoneheart group was building something in that plant they bought? Yeah, The Strain forgot too, until tonight. Setrakian saying that his and Eichorst’s final battle will be a “transaction in silver” is the kind of campy dialogue that I’m okay with. Coco is now turning, just in case you were wondering. ZACH YOU ARE THE WORST! YOU BASICALLY KILLED NORA! WHAT IS WRONG WITH YOU!?!?! Seriously though, Zach’s incompetence is no longer a stupid joke, but rather a frustrating, contrived a way to put conflict and obstacles into the story without any real justification. If there’s any hope for the third season of this show, it lies in the strange partnership of Setrakian, Fet, Gus, Quinlan, and the Silver Angel. Yeah, I don’t need a voiceover that details the plot and supposed themes at the end of every season, FX. I want an Alonso Creem spinoff, please. As soon as Nora and Zach took that photo with an unsmiling Setrakian, you just knew things weren’t going to end well. That’s a wrap on another season of The Strain. Thank for sticking around and making every single week of this exhausting show a little more bearable. See you all next year! Umm, hey! Hey, where…where are you going? Please stay!